Groundhog day was a tradition brought to the Americas from the German tradition of Candlemas. Humans have long looked to animals to predict weather. The tradition became popular in 1887 in Punxsutawney, Pennsylvania when a group of weather enthusiast called "Punxsutawney Groundhog Club" found the one true Punxsutawney Phil. His full name is "Punxsutawney Phil, Seer of Seers, Sage of Sages, Prognosticator of Prognosticators and Weather Prophet Extraordinary." His weather predictions have been recorded in Congressional Records even though his predictions have only been 39% accurate (this statistic is disputed by "Punxsutawney Groundhog Club" which claims his predictions are 90% accurate). Sadly in 1942, the "War clouds have blacked out parts of the shadows" and Phil was unable to predict the weather until 1944. 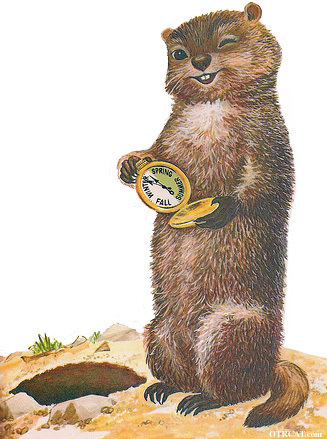 Old time radio also enjoyed the fun and festivities of Groundhog Day. In Orson Welles Almanac, Mel Blanc appears as a Groundhog. In Bob and Ray, the duo report on not reporting on Groundhog Day only to spend the hour talking about Groundhog Day. Schoolchildren love Groundhog Day and Minnesota School of the Air tells an enchanting tale of a Groundhog deviously planning to predict the wrong weather. Fairy Detective must locate this wayward Groundhog and convince him to stay in his burrow for another month. Be the first to comment on "Groundhog Day"